I have a nice little queue of posts I’m working on for future weeks, but since I’ve been working on my plants at home, I haven’t finished any of them yet! I’ve been meaning to start doing a round-up of my favorite Konmari-related links out there on the web. Since I discovered the method, I have spent a little time each week looking for stories of other people doing Konmari. I do have to spend some time wading through the annoying ones complaining that you can’t do Konmari with kids, that Konmari encourages you to value your stuff more than people, or that because your toilet brush doesn’t spark joy KM says you should throw it out. I’ve made this round-up so you don’t have to weed through those posts to get to the good stuff. When I find five or more good articles, I will add another round-up. What I have been doing instead of blogging. 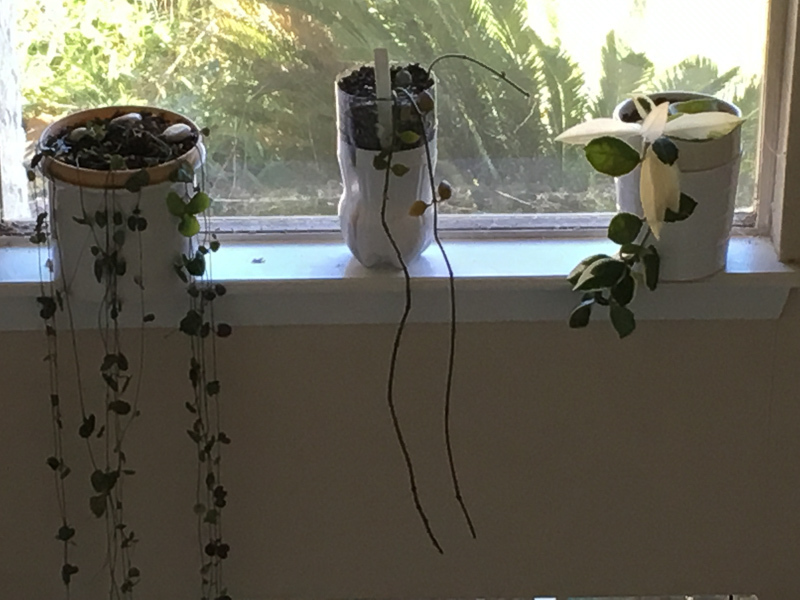 Here are two ceropegias and a hoya on a windowsill. My favorite Konmari posts are the ones in which the author has completed the method (or has at least gotten through komono). It reminds me that there is a light at the end of the process, which does have its moments of tedium. And if you’re a near-hoarder like I was, just the process of responsibly disposing of your items takes longer than the actual gathering and sorting. I still have more than a hundred books that need to go to donation or the used bookstore, but it takes time. http://rvanews.com/entertainment/konmari-primer-for-the-uninitiated/127911 A Konmari primer from the site that originally published the above article. http://www.hesowsandshesews.com/2015/07/housekeeping-hindsight.html This blogger veers close to the “KM tells you to value things more than people” in her other posts, but this is a nice positive post that details how her life has changed since using many aspects of the method to get her stuff under control. I’m a fan of the method pretty much in its entirety, but this blogger shows that you can oppose certain parts of Marie Kondo’s philosophy and still get value from the method. http://www.kaleandkant.com/sparking-joy-tidying-philosophical/ A post from January, in which the author shares her experiences with km-ing her t-shirts and then sharing the method with her children. I’d love to read an update on whether she has continued the process in her house. http://thespiritedthrifter.com/the-great-closet-konmari/ A detailed and picture-heavy post detailing how one thrifter km-ed her closet. I love her jewelry storage and am thinking about how I can adopt that type of storage for my own closet, which is a bit smaller than hers. http://www.becomingminimalist.com/the-statistics-of-clutter/ If you need motivation for starting your own Konmari journey, think about this. How much time and/or money do you waste looking after too much stuff? I still have two rooms in my house that I don’t even use because there’s still too much clutter in there… and my garage is still so full of boxes and junk that I barely have room for my lawncare stuff. (Ideally, I would have only lawncare, car care, tools, my husband’s boat, and my son’s hobby bench in there. It is far from ideal right now.) I can park my car, though! So that’s something! 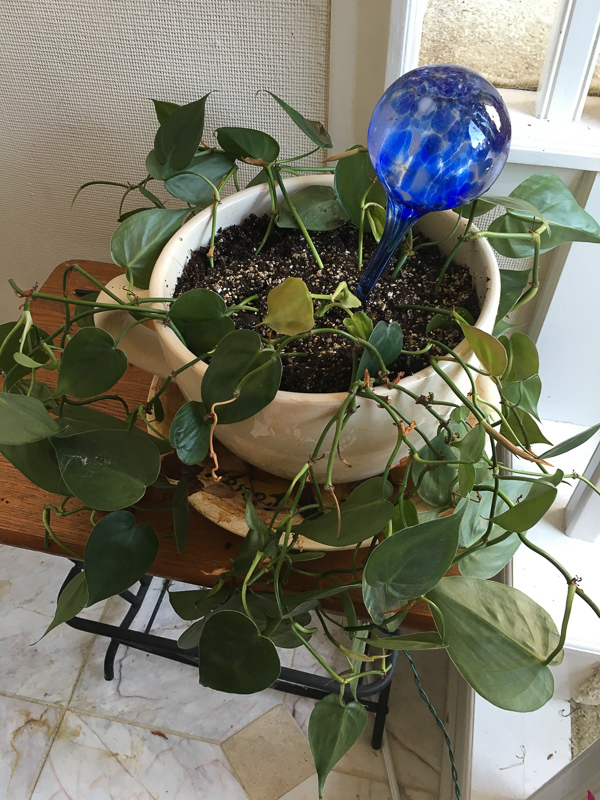 A beloved Philodendron I’ve had since I adopted it from my favorite coffee shop when the shop went out of business in the late 2000s. This is after a haircut. I hope you enjoyed this round-up. Feel free to share any great articles you have read about km in the comments. Thanks for including my Great Closet Konmari in your round up! I sometimes wonder what would happen if I stopped doing thrift-style blogging – I’m sure I would be able to reduce my wardrobe even more – perhaps even do cyclical “10-item wardrobes” like I tried last spring! In any case, the new question “does it spark joy?” has me now constantly donating pieces. It’s a new way of life!